This young athlete–like many others–struggles with social approval, which means he worries about the possibility that others may be judging his game. When he worries about what others think about his performance, he is distracted from the game at hand and unable to focus and play his best. He might worry about looking foolish in front of so many people or making a mistake in matches. Either way, such worries cause kids to perform tight and try to avoid mistakes. When young athletes worry about what others think, they can’t focus 100% on the game. They become afraid to make mistakes and take risks. They struggle with playing intuitively and freely, which is when they play their best. *Making mistakes in front of the crowd? *Looking foolish in front of others? Next, find out when they think about others and what assumptions they are making about what others MIGHT BE thinking. This is key. Identifying the assumptions they make is a big step in helping them avoid worrying so much. 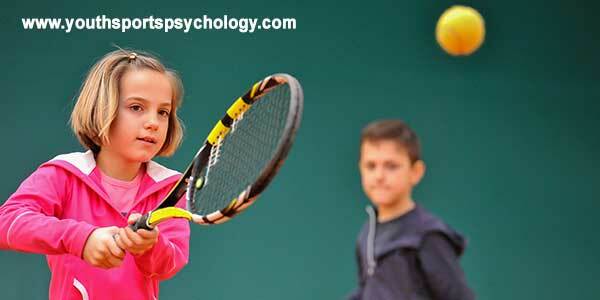 Once you have identified these assumptions, it’s time to help kids focus on the game at hand. They need to challenge these assumptions and you can help inject some reality. How do they really know others might be judging them? Remind your athletes to focus on performance cues, such as footwork, committing to the plan, and tactics. Remind them to focus on seeing the ball early and anticipating each shot. By focusing on the small important objectives, kids are less likely to worry about social approval.